Today, August 27th 2013. 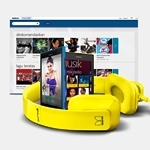 Nokia Indonesia soft launching Nokia Mix Radio for Nokia Lumia and expand their Nokia Music & Nokia Music Store for Nokia Asha & Nokia Lumia with Up To 18 Millions local & international songs. From now, All Nokia Lumia will have Nokia Mix Radio features on their Nokia Music application that will brings online/offline streaming and other Nokia Mix Radio features with up to 18 millions local & international song. Nokia Indonesia also expand their music collection on Nokia Music and Nokia Music Store with up to 18 million local and international songs. With this, you can buy & download your favorite songs directly from your Nokia devices (Nokia Asha, Nokia with Belle OS, Nokia Lumia with Windows Phone 7.8 & 8). The availability of Nokia Mix Radio & extended Nokia Music is start tonight. Please be patient until the rolling out is done.